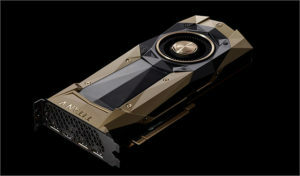 Home / Guides / Graphic Cards / nVidia’s New Titan V has been released! nVidia’s New Titan V has been released! Not even a week old, the new Titan V is already making headlines as the most powerful GPU out there. This card has some pretty impressive specs. This card is using nVidia’s new “Volta” architecture using the GV100 praphics processor. This GPU is the same one used in the Tesla V100 High Performance Compute accelerator. The graphics chip is a multi-chip module containing the GPU die and 3 HBM2 memory stacks in the same package. nVidia has placed a whopping 12 GB of HBM2 memory on a 3072-bit wide memory interface. nVidia has build this massive chip using the 12nm FinFET+ process by TSMC. On the graphics chip they’ve included an astonishing 5,120 CUDA cores, along with 640 of their Tensor cores that specialize in neural-net building/training. The CUDA cores are grouped into 80 steaming multiprocessors, for 64 each, spread along 6 graphics processing clusters. There are 320 TMUs. Clock speeds are 1200mhz core with a 1455mhz Boost frequency, and 850mhz for the HBM2 memory, adding up to 652.8 GB/sec memory bandwidth. For power, the card uses both a 6-pin and an 8-pin power connector. Display connectivity, for the refrence design at least, includes 3 DP (display port) and 1 HDMI. Of course all of this comes at a price… and that’s $2,999 USD. So then, is this the monster gaming card we’ve been waiting for? In my opinion,..no. This card is more geared towards those who need the advantage of the Tensor cores without having to build a large data center or pay for such service. However, it does mean that Volta based gaming cards are just around the corner. The Titan xV is looking to be that card. With rumored GDDR-5X memory, and likely fewer of the Tensor cores, this looks like the more likely configuration for gamers and miners alike, as the different memory will no doubt be more affordable than HBM2 while still providing well over 500GB/sec memory bandwidth. Of course we’d be more than happy to build a system around such a card.